KABUL - Even by Afghanistan’s standards of often-shifting alliances, a recent meeting between ethnic Hazara elders and local commanders of the Taliban insurgents who have persecuted them for years was extraordinary. The Hazaras — a largely Shiite minority killed in their thousands during the Taliban’s hard-line Sunni Islamist rule of the 1990s — came to their old enemies seeking protection against what they deem an even greater threat: masked men operating in the area calling themselves “Daesh,” a term for the Islamic State group in the region. In a sign of changing times, the Taliban commanders agreed to help, said Abdul Khaliq Yaqubi, one of the elders at the meeting held in the eastern province of Ghazni. The unusual pact is a window into deepening anxiety in Afghanistan over reports of Islamic State radicals gaining a foothold in a country already weary of more than a decade of war with the Taliban. Back-to-back kidnappings within a month of two groups of Hazara travelers — by men widely rumored, though far from proven, to claim fealty to the Islamic State group — have many spooked. The current threat the Islamic State group poses in Afghanistan, observers say, is less about real military might than the opportunity for disparate insurgent groups, including defectors from an increasingly fractured Taliban, to band together under this global “brand” that controls swaths of Iraq and Syria. The fear is especially keen among religious minorities like the Hazaras, who worry the influence of the fiercely anti-Shiite Islamic State could introduce a new dimension of sectarian strife to the war. “Whether Daesh exists or not, the psychological impact of it is very dangerous in Ghazni, which is home to all ethnicities,” Ghazni Deputy Gov. Mohammad Ali Ahmadi said. Unlike in Iraq or Syria, Islamic State militants control no Afghan territory and operational links between local fighters and the group’s leadership are murky. But reports of self-proclaimed Islamic State fighters have been growing since last summer. In Kandahar, the Taliban’s birthplace, armed clashes between alleged Islamic State fighters and local Taliban have been reported. U.N. Secretary-General Ban Ki-moon’s latest report on Afghanistan said a handful of Taliban commanders had declared allegiance to the Islamic State group and are increasingly seeking funding or cooperation from the group. But, it added, there is “no indication of widespread or systematic support” for Afghan fighters from Islamic State leaders in the Middle East. Some say the Islamic State group’s intolerant stance toward Shiites, which the Sunni group does not regard as true Muslims, leaves them with less traction in Afghanistan, where large-scale sectarian violence has been relatively rare since the Taliban lost power. 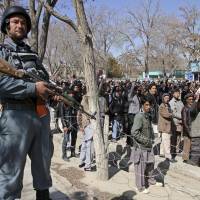 The Afghan government said the group does pose a problem. “The simple thing is that Daesh is here, and they do exist,” said Ajmal Abidy, Afghan President Ashraf Ghani’s spokesman. The International Crisis Group (ICG) in Kabul cited reliable reports that small groups of self-described Islamic State fighters are operating in six provinces, plus unconfirmed rumors of dozens of members operating in several others. For now, whatever support the Islamic State has appears to reflect divisions within the larger, stronger Taliban insurgency, said Graeme Smith, an ICG analyst. On March 15, gunmen stopped two cars in Ghazni’s Jaghori district, a predominantly Hazara area, and kidnapped eight passengers. All but one were quickly released, but the incident came just weeks after masked gunmen singled out around 30 Hazaras from two buses in Zabul province and took them hostage. Despite an ongoing rescue operation by Afghan security forces, none of the hostages have been freed. 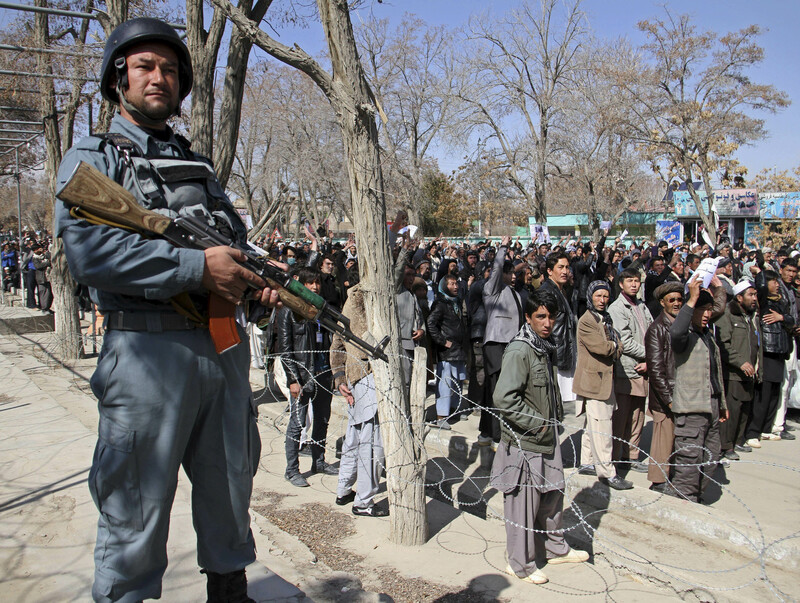 Last week, hundreds of Hazara protesters gathered in Ghazni’s capital city to demand the hostages’ release. Although no one has claimed responsibility for either attack, many of the protesters — short on answers and scared — blamed the Islamic State. “Daesh is a very dangerous phenomenon,” said protester Ahmad Ali. The general anxiety led to the Ghazni Hazara elders — from three villages in Jaghori district — to arrange their unusual meeting with the local Taliban commanders. “The Taliban did not kidnap our Hazara brothers in the past, and we know they also fight this new group, Daesh,” said Hasan Reza Yousufi, a member of Ghazni’s provincial council. Yaqubi, one of the elders who attended the meeting, said the group approached the militants seeking protection. “The Taliban agreed to help,” he said. At a crowded bus station on Kabul’s outskirts, people lined up to buy tickets to make trips along the dangerous roads outside the city that have long seen Taliban attacks — and now, many fear, targeted kidnappings. “Since the kidnapping of the passengers, we have less Hazara travelers,” said bus driver Mohammad Jan.